Spend a day in the wilds of the Taurus Mountains, exploring by jeep. 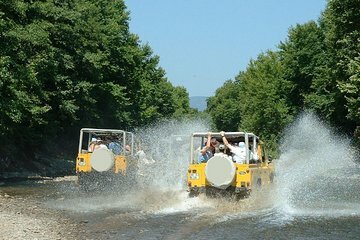 As a guide drives and navigates, you’ll sit back to enjoy an off-road adventure that takes in villages, waterfalls, and the best of the Turkish countryside. Stop for a grilled fish or chicken lunch, and then visit the waterfall of Ucansu Selalesi, a site often called the “flying waterfall.” Remember to bring a bathing suit for a cool-down dip in the natural pool before your return to Belek.